The company was founded by James Worts and his brother-in-law, William Gooderham. Worts had owned a mill in Diss, England, moved to Toronto in 1831 and established himself in the same business. He built a prominent windmill at the Toronto waterfront near the mouth of the Don River. The next year, Gooderham joined him in Toronto and in the business. The business prospered, processing grain from Ontario farmers and then shipping it out via the port of Toronto. In 1834, Worts' wife, Elizabeth, died during childbirth. Two weeks later, Worts killed himself by throwing himself into the windmill's well and drowning. Gooderham continued the business himself. With a surplus of wheat, Gooderham expanded the company in 1837 into brewing and distilling, and soon this lucrative business became the firm's primary focus. Gooderham served as the sole manager of the business until 1845, when he made Worts' eldest son, James Gooderham Worts, co-manager. In 1859, work began on a new distillery complex, the area that today is the Distillery District. It was built on the waterfront, with easy access to Toronto's main train lines. In 1862, its first full year of production, the facility made some 700,000 imperial gallons (3,180,000 litres) of spirits. At that time, it was a full quarter of all the spirits produced in Canada. In the second half of the 19th century, the firm rose to become one of Canada's most prominent industrial concerns. Under the control of William's son, George Gooderham (1830–1905), production increased to over two million gallons a year, half of the entire spirits production of Canada. The distillery itself expanded, becoming one of Toronto's largest employers. As well as keeping interests in the milling and brewing trades, the company expanded into other ventures. It had a controlling interest in the Toronto and Nipissing Railway, one of the main lines that transported grain from the rural regions north of Toronto. In 1892, the company constructed the Gooderham Building, still a notable Toronto landmark, as its new headquarters. By the end of the nineteenth century, the company's growth began to slow. Beer and wine became more popular in Canada, reducing sales of whisky. The rise of the temperance movement also harmed the company, with the Ontario Temperance Act of 1916 banning the sale of alcohol in the province. The company survived by exporting alcohol beyond Ontario, such as to Quebec, where a good portion would then make its way back to Ontario. The firm also relied on its other ventures, most notably the production of antifreeze, which was essential to the war effort and to the growing number of automobiles. In 1923, the company was sold to Harry C. Hatch for $1.5 million. The company gained a large share of the United States market during prohibition, legally manufacturing it in Canada and then selling it to resellers, who would smuggle it into the United States. In 1926, Hatch purchased Canada's second largest distiller, Hiram Walker & Sons Ltd., the makers of Canadian Club. The new company was named Hiram Walker-Gooderham & Worts Ltd. It continued manufacturing spirits at the Toronto distillery, but production gradually declined. In 1927, at a hearing on tax evasion charges against Gooderham and Worts, notorious bootlegger, Rocco Perri admitted buying whisky from the distiller from 1924 to 1927. Gooderham and Worts was convicted of tax evasion in 1928 and had to pay a fine of $439,744. In 1987, the firm was sold to the British concern Allied Lyons. 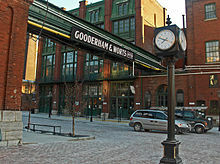 In 1990, the Gooderham and Worts distillery complex was closed and was eventually converted into the Distillery District, including the Young Centre for the Performing Arts that opened in 2006. The Hiram Walker & Sons Distillery is still in operation, now owned by Pernod Ricard. Corby Distilleries, owned by Hiram Walker, continues to make a Gooderham & Worts brand whisky. Kearney, Mark; Ray, Randy (2002), "Gooderham and Worts. ", I know that name! : the people behind Canada's best-known brand names from Elizabeth Arden to Walter Zeller, Dundurn Press Ltd.
^ Dean Beeby, “GOODERHAM, GEORGE,” in Dictionary of Canadian Biography, vol. 13, University of Toronto/Université Laval, 2003–, accessed October 11, 2015. ^ Gibson 2008, p. 89. ^ Gibson 2008, p. 143. ^ "Rum runners and whisky cargoes: Toronto during Prohibition was anything but dry". Toronto Star. 3 May 2015. ^ "Gooderham & Worts Canadian Whisky". LCBO. Retrieved December 7, 2015.